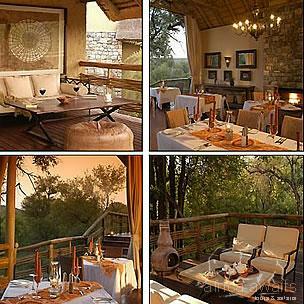 Thakadu River Camp is a wholly-owned, Community-based Tented Safari Camp within Madikwe Game Reserve. The Camp, on the banks of the Marico River, is an ecotourism partnership between North-West Parks, the Molatedi Community and The Madikwe Collection. 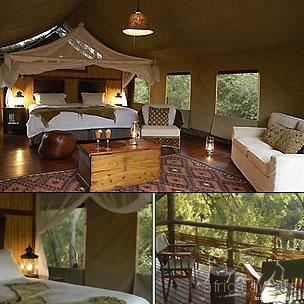 The main camp is located between the Marico River and a small tributary of the Marico. The main area comprises an open plan lounge, dining and reception area, with the pool and bar area offering views of the gully and river to the north. A traditional ‘lapa’ falls within a glade of natural riverine forest. The décor of the camp has a strong Afro-Asian Safari ambience to it, with use of natural stone, fibres, cloth and carpets as well as metal and wood featuring prominently throughout the camp. The influence of the river is very apparent, with the trees, birds and water providing a peaceful and tranquil mood within the camp. Thakadu River Camp is set within the riverine canopy along the banks of the Marico River and comprises twelve tented suites, each with their own viewing deck overlooking the Marico River. The tents are large and spacious and are wonderfully decorated and appointed. Within the canvas frame, the interior is uniquely designed to incorporate a full bathroom. Each tent has a sliding door that opens onto a private deck overlooking the river. Madikwe is home to a tremendous diversity of fauna and flora, including both black and white rhino, buffalo, elephant, lion, leopard, cheetah and wild dog. The camp is a superb open vehicle safari destination where guests are accompanied by well-trained and informative rangers who are able to interpret the many encounters whilst on safari. The Madikwe Game Reserve, situated against the Botswana border, 90 km north of Zeerust, just three hours' drive from both Johannesburg and Pretoria, is now one of South Africa's prime safari destinations. Madikwe is a Big Five game reserve covering some 75,000 hectare. It is one of the largest game reserves in South Africa. The rich diversity of vegetation ensures a wide range of game and the topography offers ideal game viewing opportunities. 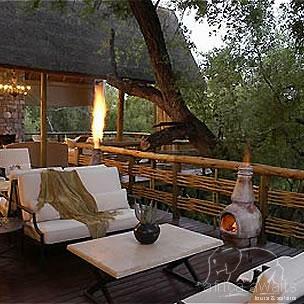 With your holiday, safari or business trip from in to Thakadu River Camp in Madikwe.